in Everglades National Park (Florida Bay). required) may NOT be counted for purpose of bag limits. spiny lobster permit. Consult your license agent for exemptions. slow to idle speed within 100 yards of a dive flag. 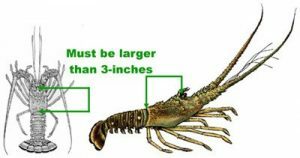 or harvesting lobster from artificial habitat is prohibited. For additional information, please visit Florida Fish & Wildlife Conservation Commission.